We set off in fine drizzle on a calm sea in Ola’s sturdy boat. Cod was drying on racks on the wharf. I was well-prepared with layers of merino, Macpac parka and waterproof shoes. While others remained in the cabin (it was freezing) nothing was budging me from the prow; I was getting the most out of the experience! How cool is that?! 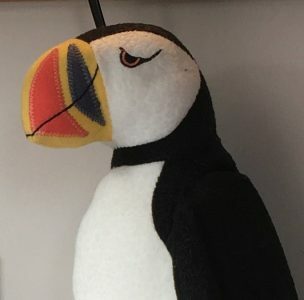 The puffins are smaller than I expected, but I was delighted to hear that there are half a million breeding pairs on these off-shore islands and the numbers have remained steady in recent years. The green cliff face where they have their burrows looks like the Hilton for puffins. I also learnt about the razorbills and saw cormorants, guillemots, gannets, herring gulls, magnificent white-tailed eagles (one caught a puffin), kittiwakes and grey seals. Not having the camera as a distraction was great; I could really look. And here I am standing on the northern tip of Europe and feeling on top of the world!